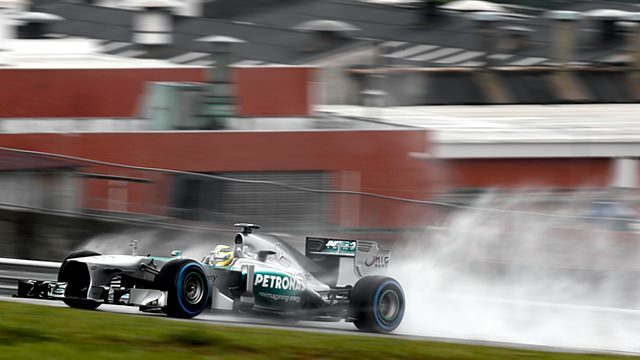 It was a wet first practice in Brazil, with drivers heading out on the intermediate and full wet tyres as the pit lane opened and the session began. Three Friday drivers were trying their hand at some damp driving, with Daniil Kvyat in at Toro Rosso, James Calado in the Force India, and Rodolfo González driving for Marussia. Mercedes led the way, in an incident-free session that gradually dried up towards the end. Sebastian Vettel was third, with Jenson Button up in fourth. The rain moved in again over Interlagos for second practice, with drivers hesitant to use up their wet tyres in case they need them later in the weekend. All 22 drivers did make an appearance, but 20 laps was the most any one car completed. Nico Rosberg topped the times, leading the two Red Bull drivers and Heikki Kovalainen fourth. From his position in fourth in FP1, Jenson Button finished last in second practice, but the McLaren driver only completed six laps altogether.